The possibilities are endless when it comes to LEDGlow’s Multi-Color Motorcycle LED Lights. With your choice of either the Mini, Advanced or Smartphone Kit that comes with your flexible LED lights, included are options such as 15 Preset Solid Colors or an App Color Wheel with Preset Colors such as Blue, Ice Blue, Red, Green, White, Pink, Purple, Orange and Yellow. Plus, with LEDGlow’s Million Color feature you can choose from a nearly-infinite variety of those colors with additional options such as anywhere from 6 to 15 unique and customizable lighting patterns that include flashing, cycle and fading patterns. These ultra-bright LEDs can be added along your turn signals, beneath your seat, and along the front or rear fenders, as well as many other parts of your bike. Look no further than LEDGlow when it comes to high quality SMD LED lights for your motorcycle. These motorcycle light kits are ideal for your Harley Davidson, Yamaha, Ducati, Honda and many other models with highlights such as Bluetooth connectivity, through which you can use included wireless remote controls to connect to the slim waterproof control box and activate your flexible lighting strips. Not only do they add a unique style to your bike which is sure to catch the eye of fellow motorcycle enthusiasts, but they also provide the added benefit of increased safety while riding at night. So you can rest-assured that you’ve reached your destination for premium LED light kits with multi-color motorcycle strip lights from LEDGlow. Multi-color LED lights for motorcycle can completely transform your bike, and the Mini Kit even further enhances the definition and detail that sport bike LED light strips provide for your motorcycle. Additional features of your Mini Kit include 15 Preset Solid Colors with 6 Unique Lighting Patterns, a wireless remote, and a waterproof control box. A 4’ Power Wire Strip and adhesion tape help in making the install process completely seamless. Combine all of these elements to create a brand-new and completely unique style and appeal for your motorcycle. While both kits are the same in many ways, there are also several subtle contrasting features between the Advanced and Smartphone Multi-Color Motorcycle LED Lights Kits. Both feature 6-piece through 30-piece SMD LED Kits, with a slim 1/4 inch strip depth. The Advanced Kit is expandable up to 250 LEDs, while the Smartphone Kit is expandable up to 1,000 LEDs. The Advanced Kit also has 15 Preset Solid Colors, while the Smartphone Kit has an App Color Wheel with Preset Colors. And the Advanced Kit has 6 Unique Lighting Patterns while the Smartphone Kit comes with 15 Unique Lighting Patterns. Another difference is the fact that the SmartPhone Kit also includes Bluetooth connectivity. However, both kits are identical in the way in which they naturally accent your bike through the use of LED strips, offering a variety of unique and engaging lighting patterns and combinations to accent your motorcycle. IS IT DIFFICULT TO INSTALL MY LEDGLOW MULTI-COLOR MOTORCYCLE LED LIGHTS KIT? 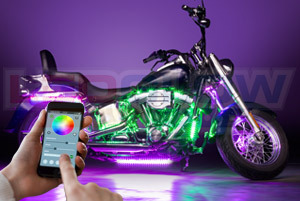 With LEDGlow, the process of installing your RGB LED accent lights to your motorcycle has never been easier. Complete step-by-step instructions are provided through the website in the form of an easy-to-follow PDF which completely outlines everything you need for the install. And for those who enjoy a video tutorial as well, LEDGlow has many instructional videos that actually demonstrate the installation process. Plus, if you ever need to speak to someone directly, LEDGlow’s customer support team is available to discuss any questions you might have. So whether you have questions about connecting your multi-color kit to your turn signals, motorcycle headlights, brake lights or another part of your bike, or if you’re seeking general service and support, LEDGlow will help guide you through the process. And when it comes to the highest professional standards in customer service and the highest quality in flexible, LED accent light kits for your motorcycle, LEDGlow delivers.